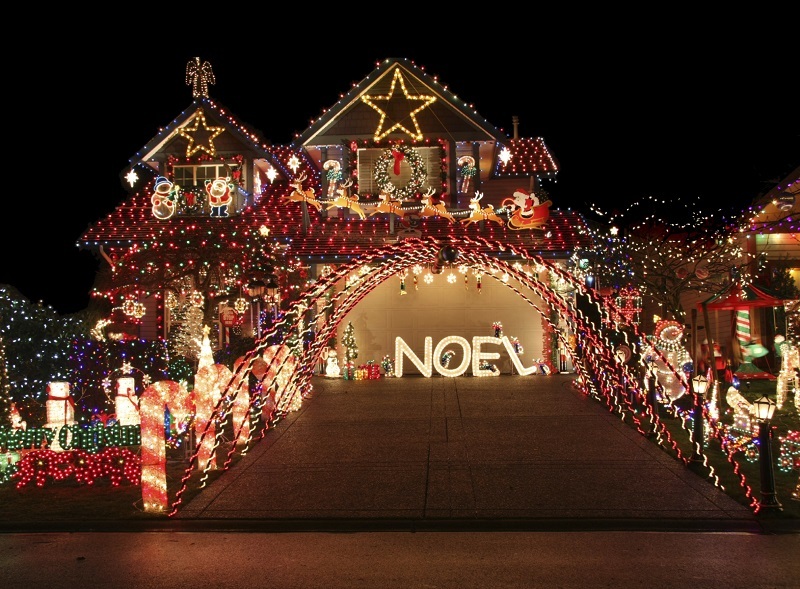 There are many ways to display your holiday cheer on your home exterior – some ways more involved than others! Now that you have packed away the spooky Halloween decorations, set aside the Thanksgiving serving platters, and started to lug up Christmas decorations from the basement, it’s time to think about making your home look as festive as you feel. Here are some fun ways to bring a healthy dose of holiday cheer to your front door. You put holiday lights all over the outside of your home, so why not put some on or around your front door? 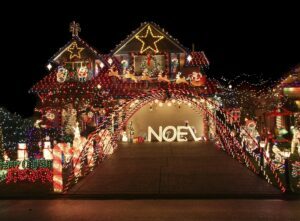 Some homeowners like to go for a classic and simple look with crisp white lights, while others have fun with multicolor or red and green lights. For the best value and longevity, opt for LED lights that are bright and environmentally friendly. Make sure the lights you choose for decorating your front door are UL rated for outdoor use so that you and your family stay safe. Holiday cheer means remembering family and things that are important to you, so don’t be afraid to raid the basement for some unique family treasures to incorporate into your front door display. Do you have a couple old antiques or pieces of cloth that are small enough to wrap them around a wreath? Old pottery can be used to display gorgeous and festive evergreen branches. If you use birdbaths and birdhouses during the summer or have some left over, incorporate them into your festive holiday display. The best way to add holiday cheer to your front door is by factoring in the surroundings on the front of your home. Are there columns you could wrap in lights, ribbon, or greenery? Make sure that all of your decorations complement each other, instead of overwhelming each other. If you are looking for help adding curb appeal and color to your residential property, Atlantic Maintenance Group is ready to help you with our variety of landscaping, asphalt, snow removal, and concrete maintenance services. We are experts in our field and we are prepared to meet your needs with a price and product that will leave you grinning. If you’re interested in getting a free quote or more information, visit us online or give us a call at (410) 768-4720. To see examples of our work and stay up to date on our specials, follow us on Facebook, Twitter, Pinterest, and Google+. This entry was posted on Thursday, December 1st, 2016	at 8:42 pm	and is filed under Blog	. You can follow any responses to this entry through the RSS 2.0	feed. Both comments and pings are currently closed.